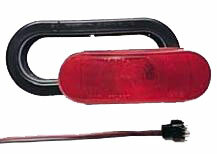 "Waterproof light for custom trailers. Oval, stop/turn/tail light. Legal in vertical, or horizontal mounting positions. Wedge base bulb is protected from vibration with the patented Vibar socket. Black grommet and plug are required for installation, and are not included except in complete kit. 7 5/8" x 3 5/16" x 2 5/8"